From there we've moved, initially upscale, through the more respectable territory of Quincy and Stoughton, all the way South to Lizzie Borden's Fall River. (That's in the gap between trendy Providence and leisurely Cape Cod, for those of you outside the rusty North-East). Now Fall River used to be a great cotton town, second only to Manchester in England, so it has its fair share of old mill buildings. One of these - some of us think it inspired William Blake, but others are sure that by “dark Satanic Mills” he must have meant the original Lucas factory - is our home. It was built in 1881 for the Laurel Lake Mills, a textile business founded by a couple of guys called Slade, which lasted until 1931. (The City of Fall River commemorates them with a nearby street, but we go one better with a jacket in our “Metropolitain” line). After textiles, luggage was made here, and now we use a couple of floors. No worries about overexposure to nature, the lake has long since been drained and paved over, and the stream that flowed out of it is now a storm sewer in a culvert under the basement. These yard-thick stone walls have seen different industries come and go, all of them making real things, craft-based, skilled people working with their heads and hands...often with machines older than they are. We've inherited a long tradition here, and we intend to pass it on. 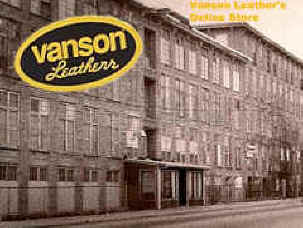 Do your share - wear Vanson!